Happy 2016! What have you been up to recently? It felt like the holidays and even the year went by so fast as we’re now approaching the middle part of January. 2015 was quite a hectic year for me. My body feels it and knows it all too well that I have decided to take a slower pace. Now, I’ve been going to bed so much earlier than I used to. I’ve taken a break from Instagram (yay!). I’ve also decided to connect more with family and old friends, not just by social media but face to face and hanging out. And I’m back to the yoga studio again! I'll look forward to re-evaluating myself at the end of the year and let's see how things will turn out then. I'm hoping that I will do well! When it comes to healthy eating, I know that we all can do something. It doesn’t have to be complicated. It can be drinking more water. Maybe eating more plants or packing our own lunch. Something we can sustain over time. One of the simple things that I teach in my cooking classes is making nut milks. This is great for those who are trying to avoid dairy. Also, even the packaged nut milks contain unnecessary processed ingredients. 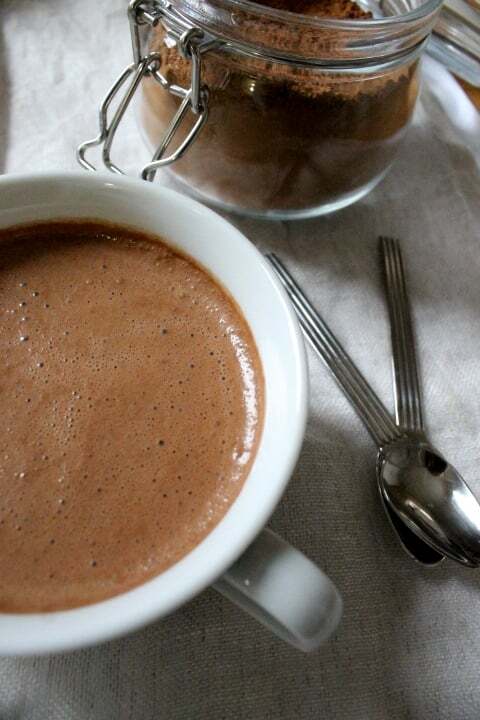 And isn’t it exciting if we can make homemade chocolate milks for us and our children? We can count our own ingredients - maximum 4-5, instead of unfamiliar ones shown here. Blend all ingredients until well incorporated. It can be served warm or iced cold. Place all ingredients in a high speed blender and whizz for up to 60 seconds until the water turns opaque. You would need a nut milk bag to strain the pulp from the almonds. If using cashews, it's not necessary. If you want to sweeten your nut milk, you can add 2 pitted Medjool dates. You can also check this older post on how to make homemade coconut milk or macadamia milk. Wishing you the best of 2016! Peaches and blueberries. Bright. Colourful. Delicious. We have a lovely harvest of organic local peaches here in Ontario at this time. And there's always blueberries in our freezer every single day (thanks to my husband). Combining these two fruits in a dessert is just wonderful. A perfect Sunday afternoon project for me. I usually make regular size cheesecakes but this time, I opted for the mini ones. They are easier to serve and also to store in the freezer. You would need a 6-cup jumbo silicone or non-stick muffin pan as a mould. I used this one. If you're using a non silicone mould, line the muffin holes with plastic wrap for easier removal later. Place all ingredients in a food processor and pulse until you achieve a sticky consistency. Scoop 2 1/2 - 3 Tbsp. of the crust into each muffin hole and press into the bottom. Everything should perfectly fit into all 6. Store into the freezer while making the Filling. 2 medium peaches, peeled and chopped, approximately 2 cups. Add the cashews, maple syrup, lemon and vanilla into a high speed blender. Blend until smooth. Set aside half of the mixture and leave the rest in the blender. Add the peaches into this and blend until well combined. Add half of the coconut oil and whizz briefly. Adjust the taste. Reserve 1/4 c. to be used for swirling. Pour halfway into each muffin hole then place in the freezer for at least 15 mins. while you go prep the next layer. Rinse the blender . Add the rest of the cashews and blueberries and blend until smooth. Mix the rest of the coconut oil and whizz briefly. Adjust the taste. Pour over the peach layer. To make swirls: Place a few dots (about 1/2 tsp ea.) of the peach mixture over the blueberry mixture then using the end of a chopstick (others use a toothpick), create some swirl designs. Freeze until firm, approximately 3- 3 1/2 hours. As mentioned in my earlier post, I hosted a Mini-Raw Cafe at our home in the early part of Summer. I served many of my raw creations to my friends. They even came early to help me prep and set up. How about that for guests! It was a lot of work but it was a blast! Here are some of the photos. I'm hoping to have another project like this is in the future again. It was so much fun! Organic teas. Flowers from my friend Aleni's garden. Hawaiian Toast. Raw Almond Bread. Avocado. Purple Cabbage. Mango Salsa. Herbs. Edible Flowers. Cashew Cream. Flax Crackers in various flavours. Candy cane beets. Raw Macadamia Cheese. Capers. Microgreens. Edible Flowers. Red peppercorn fermented cashew cream cheese on flax crackers. Pickled radish. Amaranth microgreens. Flowers.